Issues: Info on KH2's Gummi Ship's AP and the enemies's Hit Points. As in other role-playing games, the various traits of a Kingdom Hearts character are measured by their stats. Stats measure attributes such as the magnitude of damage dealt by the character's attacks, the number of abilities they can equip, or how many spells they can cast consecutively. Stats generally grow throughout the course of each game, as characters level up or complete certain objectives. Upon gaining a level in Kingdom Hearts, the bonuses, including stat increases, appear in the top-right corner of the screen. A character's level represents their overall growth, and most stats grow in tandem with the level; a low-level character will generally have less stamina and strength than a high-level character. The character's level will go up each time they obtain set amounts of experience points; normally the level is automatically increased, while in Kingdom Hearts 358/2 Days and Kingdom Hearts Re:coded, the player is instead awarded Level Up panels or chips that they can choose to equip. This generally provides the character with an assortment of bonuses to their other stats, with the exception of Kingdom Hearts Chain of Memories and Kingdom Hearts Re:Chain of Memories, in which the player chooses one of three bonuses upon leveling up. Leveling up may also grant additional bonuses besides stat increases. In Kingdom Hearts, leveling up may grant a new ability, an additional slot for items, or an additional equipment slot for accessories. In Kingdom Hearts II, leveling up may grant a new ability. In Kingdom Hearts Chain of Memories, one of the bonuses available to Sora after leveling up may be a new sleight. In Kingdom Hearts II, Drive Forms and summons gain experience and level up independently of Sora's level. The HP Gauge in Kingdom Hearts II, representing Sora's health. Hit Points, Health Points[please confirm], or HP, represent a character's or enemy's health. When damage is taken in battle or in the field, the damage is taken out of the current HP. Once HP falls to zero, the character is knocked out and can no longer fight. In the case of the main character, losing all HP results in a Game Over. HP can be restored by collecting HP Prizes, or with healing items like Potions and Elixirs, Cure magic, or some abilities. A character's current and maximum HP are indicated on-screen by the green HP gauge, which typically accompanies an image of the character. An enemy's HP gauge will appear on-screen if the Scan ability is equipped. The exception is Kingdom Hearts Chain of Memories, in which the enemy gauge automatically appears. In Kingdom Hearts, maximum HP may increase upon leveling up. Additionally, equipping some accessories also boosts maximum HP. In Kingdom Hearts Chain of Memories, HP starts at 80. Upon leveling up, the player may choose to increase maximum HP by 15. HP will eventually max out at 560. In Kingdom Hearts II, increases in maximum HP are awarded for winning certain battles or completing certain tasks. By the end of the game, HP will max out at 120. On Critical Mode, it will max at 60. In Kingdom Hearts 358/2 Days, equipping Level Up panels raises maximum HP, with the amount depending on the character. Maximum HP may also be boosted by equipping certain ring panels. In Kingdom Hearts Birth by Sleep, increases in maximum HP are awarded for winning certain battles or completing certain tasks. Additionally, equipping the HP Boost ability also boosts maximum HP. In Kingdom Hearts Re:coded, equipping Level Up, Trophy, or HP + Stat Chips in the Stat Matrix increases maximum HP, up to 400. Maximum HP may be affected by Cheat Tuners. In Kingdom Hearts 3D: Dream Drop Distance, increases in maximum HP are awarded for winning certain battles or completing certain tasks. Additionally, equipping the HP Boost ability also boosts maximum HP. The MP Gauge in Kingdom Hearts II, representing Sora's magic capacity. Magic Points, or MP, represents a character's ability to cast magic and use certain active abilities in Kingdom Hearts, Kingdom Hearts II, Kingdom Hearts 0.2 Birth by Sleep -A fragmentary passage-, and Kingdom Hearts III. Every time a spell or ability is used, the cost is taken from the character's current MP. MP can be restored with healing items like Ethers and Elixirs, or with some abilities. In Kingdom Hearts, the maximum MP determines the amount of damage inflicted by magic. A character's current and maximum MP are indicated on-screen by the blue MP gauge, which appears alongside their HP gauge. In Kingdom Hearts, maximum MP may increase upon leveling up. Additionally, equipping some accessories and weapons also can boost, or in some cases lower, maximum MP. Sora's initial maximum MP will be greater if he chooses the Dream Rod in the Dive to the Heart, and lesser if he gives it up. In Kingdom Hearts II, increases in maximum MP are awarded for winning certain battles or completing certain tasks. This section is about Ability Points. You may be looking for Attack Power or Action Points. Ability Points, or AP, determine the number of abilities that a character can equip in Kingdom Hearts, Kingdom Hearts II, and Kingdom Hearts III. While an ability is equipped, its AP cost is deducted from the character's available AP. In Kingdom Hearts, maximum AP may increase upon leveling up. Additionally, equipping some accessories also boosts maximum AP. Using an AP Up will permanently increase maximum AP by one. Sora's initial maximum AP will be lessened if he gives up the Dream Rod in the Dive to the Heart. In Kingdom Hearts II, maximum AP may increase upon leveling up. Additionally, equipping some accessories also boosts maximum AP. Using an AP Boost will permanently increase maximum AP by one. Initial maximum AP can be increased by 1 by acquiring between 650 and 1040 Munny, and by 2 by acquiring between 1050 and 1850 Munny with Roxas on Day 2. The Strength stat determines the amount of damage that can be inflicted by weapon attacks, including normal attack combos and attack commands. 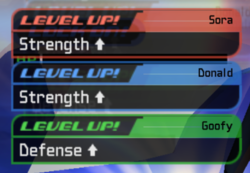 In Kingdom Hearts, Strength may increase upon leveling up. Additionally, equipping some accessories also boosts Strength. Using a Power Up will permanently increase Strength by one. Sora's initial Strength will be greater if he chooses the Dream Sword in the Dive to the Heart, and lessened if he gives it up. It can reach a maximum of 99. In Kingdom Hearts II, Strength may increase upon leveling up. Additionally, equipping some accessories also boosts Strength. Using a Power Boost will permanently increase Strength by one. It can reach a maximum of 152. In Kingdom Hearts 358/2 Days, equipping Level Up panels raises Strength, with the amount and growth rate depending on the character. Strength may also be boosted by equipping certain weapon panels or ring panels. In Kingdom Hearts Birth by Sleep, Strength may increase upon leveling up, with the amount and growth rate depending on the character. In Kingdom Hearts Re:coded, equipping Level Up, Trophy, or Strength + Stat Chips in the Stat Matrix increases Strength, up to 200. The Magic stat determines the amount of damage that can be inflicted by offensive magical attacks, including standard magic and magic commands. It also determines the efficacy of healing magic. In Kingdom Hearts, Magic used to be determined by Sora's maximum MP, and may increase upon leveling up or by equipping certain accessories and weapons that boosted it, increasing magic power the more maximum MP you had. Taking the Dream Staff would start you out with more MP, and either leaving it behind or giving it up would have you start with less MP. In Kingdom Hearts II, Magic may increase upon leveling up. Additionally, equipping some accessories also boosts Magic. Using a Magic Boost will permanently increase Magic by one. It can reach the maximum of 154. In Kingdom Hearts 358/2 Days, equipping Level Up panels raises Magic, with the amount and growth rate depending on the character. Magic may also be boosted by equipping certain weapon panels or ring panels. In Kingdom Hearts Birth by Sleep, Magic may increase upon leveling up, with the amount and growth rate depending on the character. In Kingdom Hearts Re:coded, equipping Level Up, Trophy, or Magic + Stat Chips in the Stat Matrix increases Magic, up to 200. The Defense stat determines a character's resistance to damage from enemy attacks. The higher Defense is, the less damage is taken. In Kingdom Hearts, Defense may increase upon leveling up. Additionally, equipping some accessories also boosts Defense. Sora's initial Defense will be greater if he chooses the Dream Shield in the Dive to the Heart, and lessened if he gives it up. It can reach a maximum of 99. In Kingdom Hearts II, Defense may increase upon leveling up. Additionally, equipping some pieces of armor also boosts Defense. It can reach the maximum of 153. In Kingdom Hearts 358/2 Days, with the amount and growth rate depending on the character. Defense may also be boosted by equipping certain weapon panels or ring panels. In Kingdom Hearts Birth by Sleep, Defense may increase upon leveling up, with the amount and growth rate depending on the character. In Kingdom Hearts Re:coded, equipping Level Up, Trophy, or Defense + Stat Chips in the Stat Matrix increases Defense, up to 200. Elemental Resistance works alongside Defense and reduces the amount of damage received by elemental attacks by a set percentage in Kingdom Hearts, Kingdom Hearts II, Kingdom Hearts Birth by Sleep and Kingdom Hearts Re:coded. There are resistances to Fire, Blizzard, and Thunder, as well as resistance to Dark in Kingdom Hearts, Kingdom Hearts II, and Kingdom Hearts Birth by Sleep, and resistance to Aero in Kingdom Hearts Re:coded. Kingdom Hearts 3D introduces resistances to Water and Light. A character's elemental resistance is determined by equipping accessories in Kingdom Hearts, armor in Kingdom Hearts II, Screen-type Stats abilities in Birth by Sleep and Dream Drop Distance, and Elemental Resistance Stat Chips in Re:coded. In Re:coded, each elemental resistance can be increased up to 100%. Due to the unique battle system of Kingdom Hearts Chain of Memories, Sora and Riku are given a revised array of stats, with only HP carrying over. The damage Sora deals in battle is now determined by the stats of the battle cards he uses, instead of a Strength or Magic stat. Card Points, or CP, dictate the number of cards that can be put into Sora's deck. Each card costs a certain amount of CP to be placed in a deck, depending on card type, card value, and whether the card is a Premium Card. Maximum CP starts at 275, and it can be increased by 25 after leveling up, up to a maximum of 1900 in Chain of Memories or 1625 in Re:Chain of Memories. This section is about Attack Power. You may be looking for Ability Points or Action Points. Attack Power, or AP, determine the amount of damage Riku can inflict when attacking. AP starts at 10, and it can be increased by 1 after leveling up. AP can only be selected every 5 levels, and will reach a maximum of 30. Dark Points, or DP, determines how long Riku can stay in Dark Mode. Maximum DP starts at 8, and it can be increased by 2 after leveling up at any point in Chain of Memories or once Dark Mode becomes available in Re:Chain of Memories. If increased fully, DP will cap at 99 in Re:Chain of Memories. In Chain of Memories, there is no limit to how high DP can go, only being limited by the maximum level. All recurring stats from previous games carry over into Kingdom Hearts 358/2 Days, with the exception of MP and AP. Two additional stats are also included. Critical % determines the likelihood of the next hit being a critical hit. Equipping Level Up panels raises Critical %, with the amount and growth rate depending on the character. Critical Rate may also be boosted by equipping certain weapon panels or ring panels. Crit Bonus determines the additional damage inflicted upon gaining a critical hit compared to a normal hit. Equipping Level Up panels raises Crit Bonus, with the amount and growth rate depending on the character. Critical Bonus may also be boosted by equipping certain weapon panels or ring panels. Luck increases the probability of enemies dropping items upon defeat, akin to the Lucky Lucky ability. Luck can be increased by installing rare Lucky Strike chips into the Stat Matrix. Elemental Proficiency increases the amount of damage dealt by a character's elemental attacks by a set percentage in Kingdom Hearts Re:coded. There are proficiencies in Fire, Blizzard, Thunder, Aero and Cure, the last of which boosts the amount of HP recovered by Cure commands and Esuna. A character's elemental proficiency is determined by equipping Elemental Proficiency Stat Chips, and it can be increased up to 100%. Elemental proficiency is similar in function to the Fire Boost, Blizzard Boost, Thunder Boost and Cure Boost abilities. This page was last edited on 3 April 2019, at 18:53.